Eddie Hughes MP – launches consultation on his ten minute rule bill! Eddie Hughes, MP for Walsall North, has today launched a consultation on his proposal to change the law to make carbon monoxide alarms required in more homes to help save lives from carbon monoxide poisoning. Nearly half (46%) of the nation’s homes currently don’t have a CO alarm, which could leave more than 12 million households across the UK at risk from CO poisoning. Carbon monoxide is a “silent killer” that many people haven’t even heard of. It cannot be seen, smelt or tasted. But it is also almost entirely preventable. In recent years, we’ve seen over twenty-five people killed each year in carbon monoxide-related incidents. Hundreds of people are hospitalised – 264 last year. Approximately 4,000 people go to A&E each year with symptoms of carbon monoxide poisoning. There are many more suffering ongoing effects from poisoning that remain unnoticed and these figures are deemed to be much lower than the reality as symptoms are often confused with other illnesses. On Wednesday 13th September, Eddie was given permission by the House of Commons to present a Ten Minute Rule Bill to prevent death and injury from carbon monoxide poisoning. Eddie has today published the draft law which focuses on: installation of alarms in private and social rented housing, installation of alarms in new build properties, tightening up rules for alarms in Houses of Multiple Occupation and requiring Fire Services to promote carbon monoxide safety. This proposed law isn’t a silver bullet but it will certainly help and Eddie hopes that it will also further raise awareness of carbon monoxide poisoning. Carbon monoxide poisoning is predominately a matter of housing safety, and Eddie’s proposed Bill will improve the current legislation and will contribute to a reduction in the number of unnecessary deaths each year due to CO poisoning. The stories associated with these deaths are heart-rending. Eddie is also launching a consultation alongside the draft law to help engage the wider public in raising awareness and seeking improvements from industry experts to ensure that his proposals are the best they can be. Eddie wants to hear ways to improve his draft law; from firefighters and gas fitters, to doctors, landlords and energy companies. The consultation starts today and runs until the end of the year. Stephanie Trotter attended an IGEM conference 21st November 2017 and Owen Wilson from N. Ireland showed their films (see below) and everyone seemed very enthusiastic because they were such an entertaining way of raising awareness. They were shown on prime time TV in Ireland. The cost was about 550,000 Euros for showing them for one year – not even the cost of one death! Do please watch them and let me know what you think. 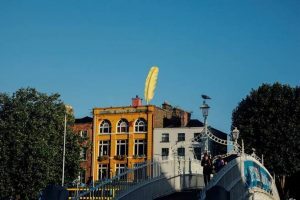 A picture of a giant yellow feather was put on a building. This was just put up with no press release or anything to explain it but then, because of the previous films, there was a social media storm!